Your Short Run Booklet, Catalog, and Magazine Supplier! "Thanks again for another great order! As always the order arrived the exact day you said it would. I have heard nothing but rave reviews about the print quality from my customers." 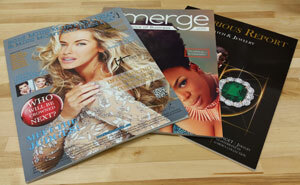 Are you ready to get a quote on High Quality, Professionally Printed Booklets/Magazines? Upfront, No Surprises Pricing and Delivery! Shipping Cost Included in Quotes! Receive your Project by your selected date! Professional Printing on New Digital Presses! Please count the pages as they are numbered in a typical book and not as sheets of paper or printer spreads. The front side counts as 1 and back as 2. If you need a custom size, please select the size that will fit your finished size. For Example: 5"x7" would fit in 5.5"x8.5"
Large - Up To 8.5"x11"
Medium - Up To 6"x9"
Small - Up To 5.5"x8.5"
If you are choosing Perfect Binding, You MUST choose a heavier cover. To Select a Heavier Cover and Cover Options, including color/monochrome printing, UV Coating, and Scoring, please click on "Use Custom Cover" below. Cover Scored prior to Finishing -- REDUCES CRACKING! Cover NOT Scored -- CRACKING LIKELY WILL OCCUR! These papers are good for informational pieces and offer excellent image quality but are difficult to write on. When Will Files Be Ready to Upload? If You'd Like an Email Copy, Please Enter Your Address Below. Please take a moment to read this message! Determine the cost to print your project utilizing the best prices currently available. Calculate the Paper weight and choose the most economical paper supplier to meet your needs while providing the lowest cost. Determine the Press-Time needed to accurately print your project. The engine will also figure the necessary Bindery-Time based on your needs to prepare it for shipping. Based on the above, the engine will then retrieve the various shipping options available from our manufacturing facility in Phoenix, Arizona to the Postal Code you enter. Prices quoted are inclusive of everything needed to print and ship your project. The ONLY item that has an additional charge, which is completely optional, is either for a Digital Proof or a Paper Proof. UNLIKE SOME SHOPS, WE DO NOT ADD HIDDEN FEES AND SERVICE CHARGES! Thank you for your time, we value it as much as you do!